The Hertzsprung-Russell diagram (usually referred to by the abbreviation H-R diagram or HRD), also known as a color-magnitude diagram (or CMD), is a diagram that shows various classes of stars in the context of properties such as their luminosity, absolute magnitude, color, and effective temperature. Created around 1910 by Ejnar Hertzsprung and Henry Norris Russell, the diagram provided a huge leap forward in understanding stellar evolution, or the "lives of stars." Scientists may also use the diagram to obtain a rough measure of the distance of a star cluster from Earth. One version of the Hertzsprung-Russell diagram is shown below. A representation of the Hertzsprung-Russell diagram. 22,000 stars are plotted from the Hipparcos catalog and 1,000 from the Gliese catalog of nearby stars. An examination of the diagram shows that stars tend to fall only into certain regions on the diagram. 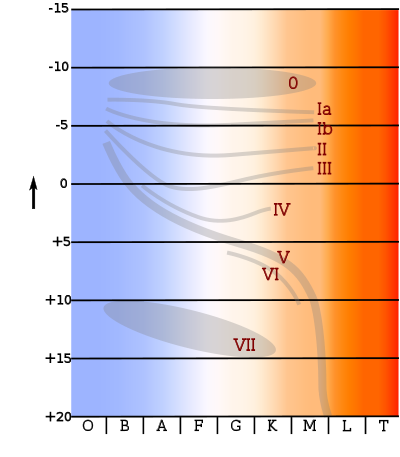 The most predominant is the diagonal, going from the upper-left (hot and bright) to the lower-right (cooler and less bright), called the Main Sequence. White dwarfs are found in the lower left area, and above the main sequence are the subgiants, giants and supergiants. The Sun is found on the main sequence at luminosity 1 (absolute magnitude 4.8) and B-V color index 0.66 (temperature 5780K, spectral type G2). HR diagrams for two open clusters, M67 and NGC 188, showing the main sequence turn-off at different ages. There are several forms of the Hertzsprung-Russell diagram, and the nomenclature is not very well defined. The original diagram displayed the spectral type of stars on the horizontal axis and the absolute magnitude on the vertical axis. The first quantity (namely, spectral type) is difficult to determine unambiguously and is therefore often replaced by the B-V color index of the stars. 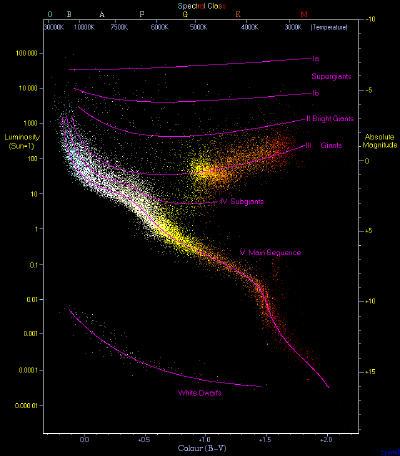 This type of Hertzsprung-Russell diagram is called a color-magnitude diagram, and it is often used by observers. However, a color-magnitude diagram is also used in some cases to describe a plot with the vertical axis depicting the apparent magnitude, rather than the absolute magnitude. In another form of the diagram, the effective temperature of the star is plotted on one axis, and the luminosity of the star is plotted on the other. This is what theoreticians calculate using computer models that describe the evolution of stars. This type of diagram should probably be called temperature-luminosity diagram, but this term is hardly ever used, and the term Hertzsprung-Russell diagram is preferred instead. Despite some confusion regarding the nomenclature, astrophysicists make strict distinctions between these types of diagrams. The reason for this distinction is that the exact transformation from one to the other is not trivial, and it depends on the stellar-atmosphere model being used and its parameters (such as composition and pressure, apart from temperature and luminosity). Also, one needs to know the distances to the observed objects and the interstellar reddening. Empirical transformation between various color indices and effective temperature are available in the literature (Sekiguchi and Fukugita 2000, Casagrande et al. 2006). The H-R diagram can be used to define different types of stars and to match theoretical predictions of stellar evolution using computer models with observations of actual stars. It is then necessary to convert either the calculated quantities to observables, or the other way around, thus introducing an extra uncertainty. Most of the stars occupy a region in the diagram along a line called the Main Sequence. During that stage, stars are fusing hydrogen in their cores. The next concentration of stars is on the horizontal branch, corresponding to helium fusion in the core and hydrogen burning in a shell surrounding the core. Another prominent feature is known as the Hertzsprung gap, located in the region between A5 and G0 spectral types and between +1 and −3 absolute magnitudes—that is, between the top of the main sequence and the giants in the horizontal branch. RR Lyrae stars can be found to the left of this gap. Cepheid variables reside in the upper section of the instability strip. Supergiants: They are among the most massive stars. In the Hertzsprung-Russell diagram, they occupy the top region of the diagram. In the Yerkes spectral classification, supergiants are class Ia (most luminous supergiants) or Ib (less luminous supergiants). Their mass range is from 10 to 70 solar masses and brightness range is from 30,000 up to hundreds of thousands of times the solar luminosity. They vary greatly in radii, usually from 30 to 500, or even in excess of 1000 solar radii. Because of their extreme masses, they have short lifespans of 30 million years down to a few hundred thousand years. Supergiants occur in every spectral class, from young blue class O supergiants stars to highly evolved red class M supergiants. Bright giants: Bright giants are stars that straddle the boundary between giants and supergiants. This classification is generally given to giant stars with exceptionally high luminosity, but which are not sufficiently bright or massive to be classified as supergiants. In the Yerkes spectral classification, they are assigned luminosity class II. Giant stars: A giant star is one with substantially larger radius and luminosity than a main sequence star of the same surface temperature. Typically, giant stars have radii between 10 and 100 solar radii and luminosities between 10 and 1,000 times that of the Sun. Stars still more luminous than giants are referred to as supergiants and hypergiants. A hot, luminous main sequence star may also be referred to as a giant. Giant stars correspond to luminosity classes II or III. Subgiant stars: Subgiants form a class of stars that are slightly brighter than normal main sequence (dwarf) stars of the same spectral class, but not as bright as true giant stars. They are believed to be stars that are ceasing or have already ceased fusing hydrogen in their cores. In stars of roughly a solar mass, this causes the core to contract, which increases the star's central temperature enough to move hydrogen fusion into a shell surrounding the core. This swells the star on the way to becoming a true giant. At the start of the subgiant phase, the diameter and brightness have increased, but the star has yet to cool down or change color significantly. Later, subgiants that are closer to becoming true giants have larger diameters and lower temperature than stars of similar mass in the main sequence. In the Yerkes spectral classification, their luminosity class is IV. Main sequence stars: The majority of stars on a typical HR diagram lie along the main sequence curve. This line is so pronounced because both the spectral type and the luminosity depend only on a star's mass, at least to zeroth order approximation, as long as it is fusing hydrogen at its core—and that is what almost all stars spend most of their "active" life doing. These main sequence (and therefore "normal") stars are called dwarf stars. This is not because they are unusually small, but instead comes from their smaller radii and lower luminosity as compared to the other main category of stars, the giant stars. In general, the more massive the star the shorter its lifespan on the main sequence. After the hydrogen fuel at the core has been consumed, the star evolves away from the main sequence on the HR diagram. White dwarfs represent the final evolutionary stage of many main sequence stars. White dwarfs: A white dwarf, also called a degenerate dwarf, is a small star composed mostly of electron-degenerate matter. Its mass is comparable to that of the Sun, but its volume is comparable to that of the Earth. Consequently, it is very dense. Its faint luminosity comes from the emission of stored heat. White dwarfs make up roughly 6 percent of all known stars in the solar neighborhood. White dwarfs are thought to be the final evolutionary state of all stars with a mass that is not too high—over 97 percent of the stars in the Milky Way galaxy. Contemplation of the diagram led astronomers to speculate that it might demonstrate stellar evolution, a main suggestion being that stars collapsed from red giants to dwarf stars, then moving down along the line of the main sequence in the course of their lifetimes. However, following Russell's presentation of the diagram to a meeting of the Royal Astronomical Society in 1912, Arthur Eddington was inspired to use it as a basis for developing ideas on stellar physics (Porter, 2003). In 1926, in his book The Internal Constitution of the Stars, he explained the physics of how stars fit on the diagram. This was a particularly remarkable development because at that time the major problem of stellar theory—namely, the source of a star's energy—was still unsolved. Thermonuclear energy, and even that stars are largely composed of hydrogen, had yet to be discovered. Eddington managed to sidestep this problem by concentrating on the thermodynamics of radiative transport of energy in stellar interiors (Smith, 1995). On that basis, Eddington predicted that dwarf stars remain in an essentially static position on the main sequence for most of their lives. In the 1930s and 1940s, with an understanding of hydrogen fusion, scientists formulated a physically based theory of evolution to red giants and white dwarfs. By this time, study of the Hertzsprung-Russell diagram did not drive such developments but merely allowed stellar evolution to be presented graphically. The H-R diagram may be used by scientists to roughly measure how far away a star cluster is from Earth. This can be done by comparing the apparent magnitudes of the stars in the cluster to the absolute magnitudes of stars with known distances (or of model stars). The observed group is then shifted in the vertical direction, until the two main sequences overlap. The difference in magnitude that was bridged in order to match the two groups is called the distance modulus and is a direct measure for the distance. This technique is known as main-sequence fitting, or, confusingly, as the spectroscopic parallax. ↑ Richard Powell, The Hertzsprung-Russell Diagram. Retrieved December 21, 2008. ↑ Michael Richmond, Stellar evolution on the main sequence. Retrieved December 22, 2008. ↑ Patrick Moore (ed. ), Giant star, in Astronomy Encyclopedia (New York: Oxford University Press, 2002, ISBN 0195218337). ↑ Jacqueline Mitton, Giant star, in Cambridge Dictionary of Astronomy (Cambridge: Cambridge University Press, 2001, ISBN 0521800455). ↑ Australia Telescope Outreach and Education, Main Sequence Stars. Retrieved December 22, 2008. ↑ Patrick Moore, The Amateur Astronomer (Berlin: Springer, ISBN 1852338784). ↑ Swinburne University, White Dwarf, COSMOS—The SAO Encyclopedia of Astronomy. Retrieved December 22, 2008. ↑ Todd J. Henry, The One Hundred Nearest Star Systems. Retrieved December 22, 2008. Casagrande, L., L. Portinari, and C. Flynn. 2006. Accurate fundamental parameters for lower main-sequence stars (Abstract). MNRAS. 373(1):13–44. Retrieved December 13, 2008. Porter, Roy. 2003. The Cambridge History of Science. Cambridge, UK: Cambridge University Press. ISBN 9780521572439. Sekiguchi, Maki, and Masataka Fukugita. 2000. A Study of the B-V Color-Temperature Relation. The Astronomical Journal 120 (2): 1072–1084. Retrieved December 13, 2008. Smith, Robert. 1995. Observational Astrophysics. Cambridge, UK: Cambridge University Press. ISBN 978-0521278348. All links retrieved December 22, 2017. The first Hertzsprung-Russell diagram. Leos Ondra. This page was last modified on 22 December 2017, at 20:19.